Have you heard of a Japanese dessert, Taiyaki（たい焼き）? This fish-shaped cake is a very common Japanese dessert from long time ago. The dough is like a pancake and inside there are sweet red beans stuffed. In Tokyo, there are lots of famous Taiyaki stands, on weekends sometimes people are waiting hours to eat. I do love Taiyaki, and have been trying varieties of them in Tokyo. I will introduce 5 best Taiyaki stands from my experience. About 6min walk from Yotsuya Station, (which is 1 stop away by Chuo-Line from Shinjuku), there is this famous taiyaki stand. Wakaba was established in 1895. 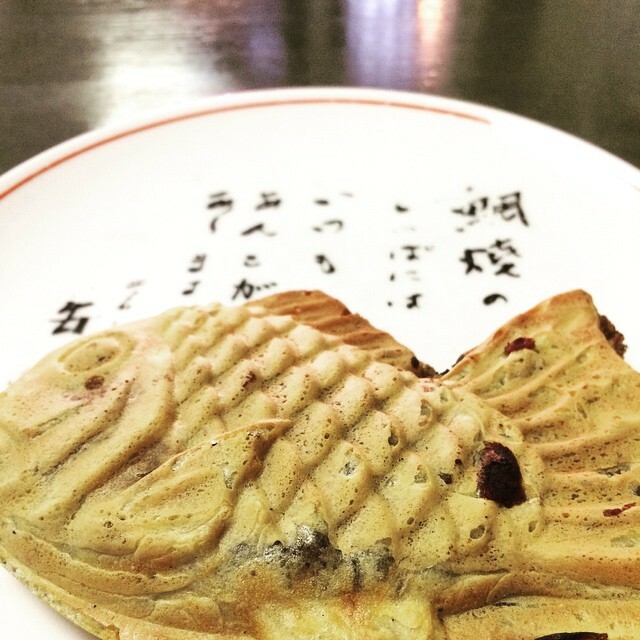 As it continues to bake taiyaki for 120 years, the taste of their taiyaki is unforgettable. Inside Wakaba’s taiyaki, red beans are stuffed fully until its tail. Their dough is a bit salty and that salty taste and sweet red beans matches so well. It is as big as make my stomach full by just eating a piece. People are always lined up to buy their taiyaki. There are also eat-in space so you can sit and enjoy freshly baked Taiyaki inside. It is ¥150 for one taiyaki. Served while it lasts. Closed on Sundays. Naniwaya Souhonten established in 1909. Naniwa is an old name for “Osaka”, the owner named this after his hometown. There is a cafe inside, you can choose to eat it there or take out. In cafe, they also have other traditional Japanese desserts such as kakigori, oshiruko and anmitsu. Their dough is rather thin, so you can taste the sweetness of red bean strongly. So thin that you can see through the red bean paste. Of course red bean paste is STUFFED until its tail! It is said maximum production per day is only 2,000. Usually there is a waiting line, and you will have to wait 20-30 min. It is ¥150 per one taiyaki. Roppongi is walkable distance from here, so buy a Taiyaki and have a little walk. Served while it lasts. Closed on Tuesdays and every third Wednesday of month. Ningyo-cho is 3 station away by Metro from Tsukiji. Walk 5 min from Ningyo-cho Station, you will find Yanagiya. Their dough is thin and crispy. Red beans are stuffed but not too sweet. They emphasize the natural taste of flour and red bean, so they seem to not use too much sugar. This taiyaki is rather a bit salty and light. It is ¥140 per taiyaki. Since it is close to Tsukiji, you are easy to stop by after visiting Tsukiji Fish market. So far I have introduced long established Taiyaki stands. 4th one is “Hiiragi” in Ebisu. They have their own speciality and it is this taiyaki, yes, dipped in ice cream. This menu is called “Taiyaki Soft” (Soft came from soft ice cream). Taiyaki is usually hot so people do not eat often in summer. But in this way, you can both taste hot and cold. “Taiyaki Soft” is served during summer. Served while it lasts. Closed on Mondays. Ajisaki is located in the B1 floor of Seibu Ikebukuro department store. Their speciality is the variety of flavors. They make normal dough and matcha dough taiyaki. This is “Matcha Custard Cream” custard cream stuffed in matcha dough. This is “Matcha Shiratama”, rice flour dumping and red bean paste stuffed in matcha dough. And “Cream Cheese and Red Bean”! You won’t believe but this combination is a miracle and I was once addicted to it. They also have seasonal flavors. If you want to taste creative taiyaki, should definitely try.